For the past 2 years this Vegan Seafood Pasta Recipe has been my favourite go-to recipe for Christmas – it simply has a special feel to it and I can’t really put my finger to why that is. Is pasta festive? What do you think? For me it definitely is, and the reason why I feel like that is probably cause my mum liked to get creative with the food for Christmas eve. Whilst we had a whole range of traditional dishes for Christmas when I grew up, I can clearly remember one year, that my mum created a seafood pasta for Christmas dinner – ‘just to have something else for once’. Needless to say that I loved the dish back then (I obviously wasn’t vegan yet) and it seems to have manifested itself in my brain as the most outstanding & extravagant Christmas dinner we’ve ever had with the family. Whether Christmas or not – I believe this Vegan Seafood Pasta Recipe takes your pasta to the next level and it’s the perfect dish for a special occasion. On Christmas 2017, I attempted to re-create a vegan version of what my mum cooked back then – but guess what? I didn’t take notes of my recipe (yup food bloggers have those kinda days too ;)). So when I decided to add the recipe to the blog for this year’s Christmas recipe round up, I had to do quite a bit of recipe testing to get it right. But here we are: Vegan Seafood Pasta! And believe me: it turned out so super scrumptious and I’m actually tempted to make it again for Christmas this year. 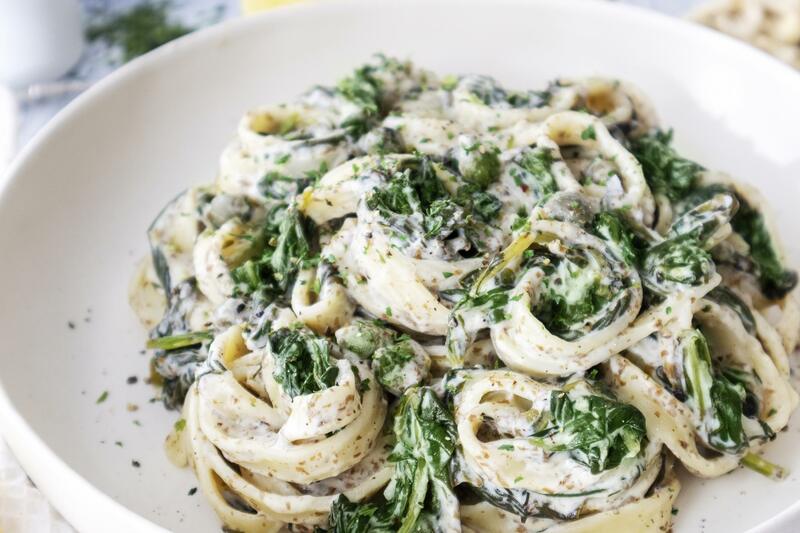 To get the right flavour into this pasta dish, I am using a mix of seaweed, lemon, capers and white wine – alongside a few other spices and herbs. 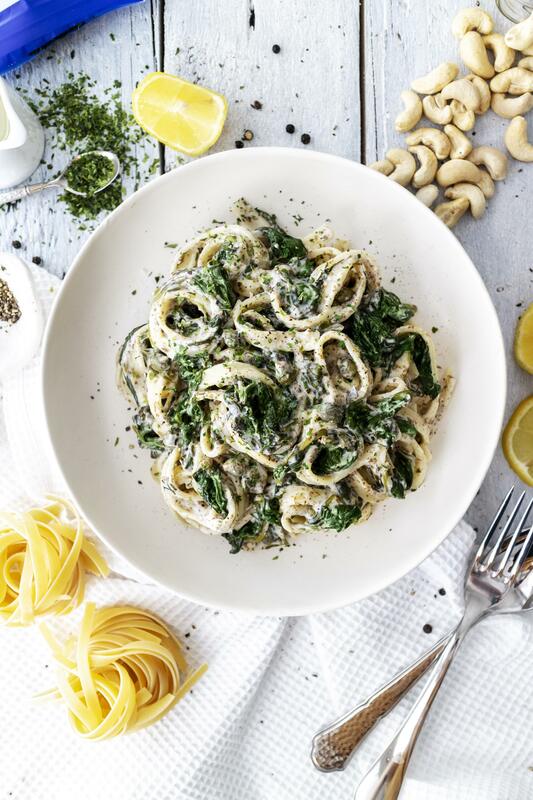 Don’t be alarmed with using 100ml white wine in the recipe – the alcohol evaporates when cooking the sauce, and you’ll be left with a fantastically balanced pasta sauce. For the creaminess in the sauce, I have used cashews that I soaked over night – however, if you’re in a rush, you can also cook the cashews in boiling water on the stove for about 20 minutes to soften them and get them ready for the sauce. 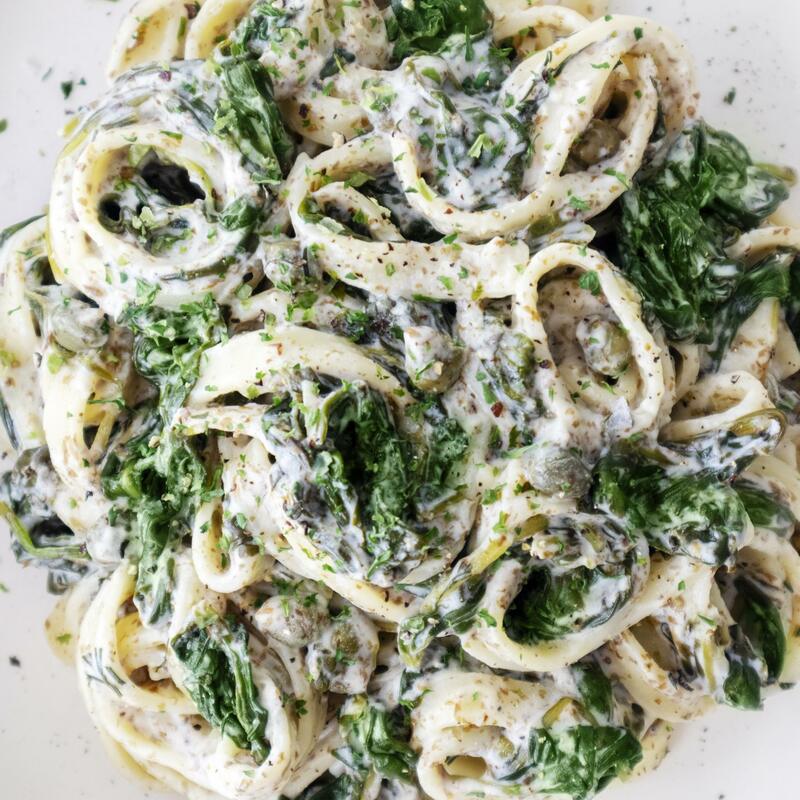 Looking for more vegan pasta dishes? Check out my vegan pasta recipes here.